Our Medelita H.I.P. (Honoring Inspiring Professionals) Program is one of the many ways we connect with people who truly love the Medelita brand and the values that we stand for: supporting the development of medical professionals, particularly for women in medicine; giving back to our community; and spreading integrity, kindness, and respect. Is there anyone who fits these values better than Erica Wigdor? We don't think so! 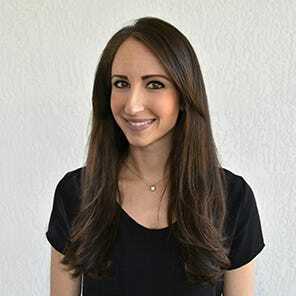 Whether she's providing exceptional care for her patients, working hard on her soon-to-launch blog, or showing off her creative side on Instagram, this Internal Medicine Resident is an emblem of leadership and poise for those pursuing a career in medicine. What is the most important thing for someone to know about your job? People often ask me what exactly do Internal Medicine physicians do. Do we work in a Hospital? Do we do surgery? I think the most important thing for people to know is that Internal Medicine is a very broad field. It means that we go to medical school for four years after college, and then residency for three years after that. Once residency ends we can choose to practice either in a hospital setting, known as a Hospitalist, or an outpatient setting, known as a primary care physician. If we want to specialize, we can peruse a fellowship in various fields such as cardiology, endocrinology, gastroenterology, etc., which adds more time after residency depending on what fellowship you want to go into and how specialized you want to get. No, we don’t do surgery, but we can do certain procedures. For me, I am going into an outpatient practice as a primary care physician. I will see patients for their annual checkups and as needed in between. I plan to eventually become sub-specialized in nutrition, and to incorporate that into my practice as I do feel it is crucial in preventative and homeopathic medicine. What first drew you to a career in medicine? As a little girl, I often joined my father at his Optometry office. I played with his instruments and watched him interact with patients. I would put my name over his on the sign on his door, and would pretend to be the doctor. Over time, several things happened in my life where I was exposed to health care on a more personal basis. My little sister was born at 24 weeks, at 1 lb. 2 oz., and I was in the NICU every day for 4 months after school visiting her and learning more about medicine. After that my grandfather was diagnosed with hepatic failure and passed from complications of sepsis, and my grandmother was taken by cancer. Each time I was exposed to medicine, I knew I wanted to be involved with the treatment and care of patients myself. I wanted to learn more about diseases and how to prevent them from occurring to others. What do you think is one thing that everyone who works in medicine has in common? One thing that everyone who works in the medical field has in common is compassion. Whether it is compassion for their specific field of medicine, for their research, or for their patients, we are all caring people. We chose this field because we want to take care of others and help change the world in a positive way. What words of advice would you share with someone who is considering your career choice? Don’t ever give up. Know what you want to accomplish and keep on fighting to get there. There will be days when life gets difficult, when you might feel like what you are doing is futile, but always remember that you chose this for a reason. If you need to take a break to relax or unwind, travel, or spend time with loved ones, do it. But know that once you achieve your goal, it will all be worth it. If you weren’t in medicine, what do you think your career would have been? If I weren’t in medicine, I would have been a chef or baker. Few people know this about me, but my back up to medical school was culinary school. All through college I loved hosting dinner parties at my apartment and baking whenever I had time. Playing music and whipping up a delicious dish is cathartic to me. I still do it whenever I can, but it doesn’t happen as often as I would like it to. Maybe one day I’ll open a bakery. Keep your eyes open for it! When you’re not working, how do you spend your free time? When I’m not working, there are many things I like to do with my free time. Most days I like to stay active, such as biking or jogging to the beach, and other days I like to relax with some binge TV or a nice bubble bath. I also love to travel whenever possible, but that usually requires more extensive amounts of free time. Tell us one fact that most people don’t know about you. I am a huge nerd. Not your typical “I’m a science major so I’m nerdy” type of nerd, but the “I love Harry Potter and anything else science fiction or fantasy” kind of nerd. I have read all the HP books (twice) and made my boyfriend get an annual pass to Universal Studios and Islands of Adventure with me so that we could visit HP world several times a year. Aside from that, I laugh at ridiculous sarcastic or pun jokes, and most times I think I’m funnier than I am. I feel most powerful when I overcome an obstacle. When I have a confusing case but still come to a diagnosis, or when I am unsure of what to do next but I come to conclusion on my own. We all second guess ourselves sometimes, but being able to apply the knowledge I acquired over the years makes me feel like I did something right. How would you describe your professional style? What does professional style mean to you? To me, professional style is not about outward style and appearance, but how you carry yourself as a physician. The way you interact with others around you and the way you treat others. Not just your superiors or your colleagues, but your patients as well. You never know what someone might be going though, and how you treat them could really make all the difference. 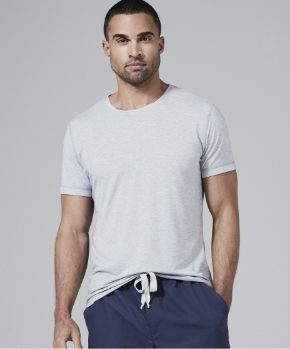 What is your go-to professional outfit? 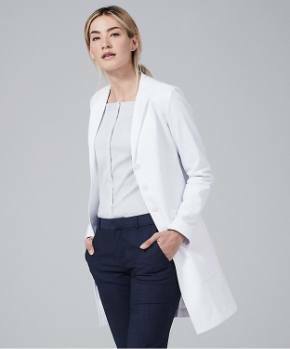 My go to professional outfit is black pants, a cute colorful top, short heeled (comfortable) pumps, the perfect (simple) accessories, and a nice clean white coat. You can never go wrong with a nice watch, a bracelet or two, and some colorful earrings to match your ensemble. 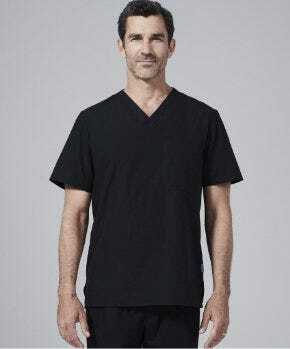 What are the most important things you look for when you’re shopping for new medical lab coats or scrubs? When shopping for a new lab coat I always make sure it has the right number of pockets. Necessary pockets include but are not limited to: a pocket for my stethoscope, ipad, cell phone, emergency snacks, and pens/business cards. I also like lab coats that are more fitted. What is your favorite Medelita product and why? My favorite Medelita product is the Miranda B. 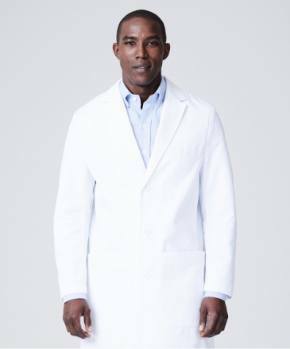 Slim Fit Lab Coat. It has just the right amount of pockets, it is tailored specifically for a woman’s body, and has a sharp professional look to it. 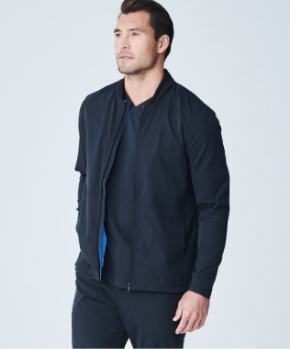 You can dress it up with business casual or dress it down with scrubs and sneakers. It honestly looks good no matter what. Who has been the most influential female role model in your life or your career? The most influential female role model in my career is not just one person, but many. My role models are all of the females who came before me, from the first female to graduate from medical school in 1849, to the first female surgeon in 1855. We haven’t always had it easy in this profession, but we have certainly made ourselves known. I am truly blessed and honored every day to be one woman, among many, who have made a difference in the medical field. In addition to women in the medical field, there is one woman in particular who has made a true difference in my life, and is my ultimate role model - my mom. She is the most selfless and loving woman I know. She raised me into the person I am now and dedicated her life to being there for me whenever I needed her, and even when I didn't. She let me move back in with her during my first two years of medical school and even turned her garage into a room for me. She cooked for me, did my laundry, and made my life as easy as she possibly could. Without her I would not be where I am today, and for that I will forever be grateful.